Entry by Meo on Mon Jun 10 03:29:21 2013. And for the I-don't-know-how-many-time, the first boy on the left is FIRE! NOT RED! Sorry, but Red has black hair, and that boy has brown hair, so it's Fire. Not Red. Does a polite comment take much time? [Leaf (Pokémon)] and [Blue (Pokémon)] tags were merged. I don't know much about Red/Ash/Fire so I messed this up. My bad, thank you. And I didn't know Leaf and Blue tags were merged, my bad, thank you. I wonder if Meo is confused as much as I am on here regarding Fire and Red? Red is Red. I saw no Fire. Nintendo never purposely create a "Fire" when they remade Pokemon Red/Blue/Green into FireRed and LeafGreen. Doesn't matter if they changed his hair color, they just redesigned him like they did again in Pokemon HG/SS and B/W2. If there really would have been a "Fire", then there would have been a "Heart" or "Soul" or some similar extra male protagonist name when they remade Pokemon Gold/Silver to HeartGold and SoulSilver. They just redesigned Gold in those remakes like they redesigned Red in his remakes, so I will forever be confused on this site. I think I will ask this on the forums. Other than that, a wonderful image. I usually choose the girl because of the male being more of a simple design usually.... and that I'm female, but since X and Y has customizable outfits, I'm curious to see what he would have to offer. Because those two in B/W and B2/W2 are actually two different people? Pokemon Company/Nintendo really did want to make new protagonists in B2/W2, hence the different names and designs. B2/W2 are sequels to B/W, and the plot of B2/W2 is set years after B/W. And I don't know why a "Fire" tag and a "Red" tag exists when they are really the same person. That's what I was asking people like YOU lol. Someone else said that they actually are the same, but you guys just went with the fact that they are totally different people when they are really not. So I asked to see if that was really the case. I still didn't really get my answer. For me, Red and Fire are two different persons. Just... Red has black hair, Fire has them brown. and they're not dressed the same way. Look the ultimate trainer in G/S/C and HG/SS, he has BLACK hair, so it's Red! Okay. lol That's all I ever wanted. Now I'm not really confused. If you guys believe that they are two different people, then by all means. I might as welll join in, whether that is the truth or not I guess. Oh, and nice perception of the hair color difference from FR/LG and HG/SS. I thought I sensed something weird about you... hmmm. Look, if Red has black hair like he does in Heart Gold and Soul Silver, people refer to him as HG/SS!Red. If he has light brown hair like he does here, then he's FR/LG!Red. However! Several fans outside of Japan refer to FR/LG!Red as Fire. But that's just because the female FR/LG protagonist is named Leaf. If Red has black hair which is spiked at the front, that's Manga!Red or PokeSpe!Red. If it's Red from Red and Blue, then, he's just known as Red. If you see that guy from the Anime that sort of looks like Red, that's Ash Ketchum. They are two different people, and Ash was based on Red. So, you see, it's quite simple to tell the Red's apart. Holy sheat. New girl protagonist has blond hair and everyone else is a shade of brown. That's so awesome. xD ..Cept Dawn's. In japan the red from leafgreen and firered and the red from the original games are both red. You can consider them different people but they have the same name, much like gold from silver and gold and gold from heartgold and soulsilver... they're both gold, if you're going to consider them different people that's up to you, but they have no character called fire, and "fire" was just a name created by fans to differ brown haired red and black haired red, since some consider them to be different characters. Blue and Leaf ARE different people though, just like Crystal and Heart. I, personally, see Red and Fire both as Red, but I understand why some people see them as two separate characters. I can always tell them apart. Red (Japanese: レッド Red) is the canon name of the player character in the Generation I games Pokémon Red, Green, Blue, Yellow and the male choice in their Generation III remakes Pokémon FireRed and LeafGreen, where his female counterpart is Leaf. Red is known throughout as the Champion from Pallet Town, as well as the living legend for his defeat of Team Rocket in Kanto during his quest. He is the final opponent in the Generation II games Pokémon Gold, Silver, and Crystal, their Generation IV remakes Pokémon HeartGold and SoulSilver, and Pokémon Stadium 2. Its just a redesign. Similar to Ethan from Gold/Silver and HG/SS. ^ YEAH!!! thank you, everyone here seems to think they are different persons, but they are the same, there was even an image where my comments were deleted because I said they were the same person. Maybe I'm just biased because I love the original Red design so much. It's much more appealing colour wise than the FireRed design. ALSO! Regarding the different person/same person thing for Red and Fire, from my understanding that became a thing because of the redesign, people wanted to be able to distinguish between the different designs easily because, naturally, some preferred the new and some preferred the old. There's also the whole 'female counterpart' being a thing in FireRed and not in Red so maybe some people see that as a different reality/universe of some kind? Plus, I think a lot felt that the redesign gave 'Fire' a different air than Red, Red is typically perceived as being placid, stoic and quiet, not talking much due to the lack of speech from the trainer in the first game (and maybe in FireRed too? I haven't played it so I don't know) where's, from what I've noticed people saying, the design having brown hair sticking out gives him a more 'playful' air? I've seen some people talking about this and the different personalities thing on forums, I'm guessing it's a common thing since in pictures with 'Fire' he's often shown with more 'personality' and smiling and all that jazz where's Game Red (Manga Red is a different case again) is almost always drawn very neutral and placid. I actually really like the neutral thing with Red, it makes a lot of fanart look really cool and "unearthly"(?) Plus it's really weird for a main character to be like that, mains are usually more like Gold. When I saw it, it was already a little late, and I found it weird to say something about a comment that old. So...is anyone here a boy or a girl? Where's Crystal ;w; she was the first playable girl. 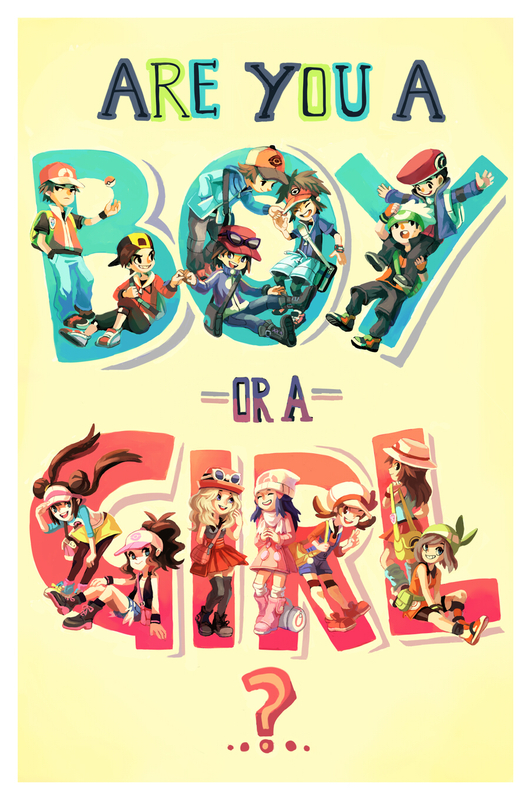 Then the hipster liberals attacked and forced pokemon to put about 10 more gender options in the game.